Adeola’s name (which means “crown of honor” in Yoruba) and her family have always helped her stay rooted in community and embody the power of those who came before her. She grew up in a culturally dynamic, working class, primarily immigrant community in Providence, Rhode Island. Adeola has over 17 years of experience in nonprofit leadership and consulting, which includes strong connections with young people and communities of color. She’s the former executive director of Youth In Action, a youth driven nonprofit based in Providence that supports young people to bring their collective vision for social justice to life in the learning and community spaces they navigate. She moved on from that position in 2014 after almost 12 amazing years of working and growing with the organization. Now Adeola is an organizational development consultant supporting social justice-oriented nonprofits, schools, and institutions to build capacity through facilitation, training, and coaching. She centers collective healing and well-being as well as communities of color in her work. She does that independently and as an affiliate with the Interaction Institute for Social Change. 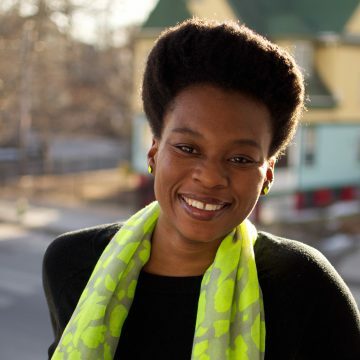 Adeola also helps to convene the Free Minds Free People national education conference, organizes Undoing Racism workshops in her community, and has served as a board member with the Providence School Board, the Women’s Fund of RI, and AS220.